The far-right British National Party has backed Boris Johnson in the ongoing row over his comments about Muslim women who wear the burqa. A statement on the party’s website praises Johnson for refusing to apologise and compares him to Donald Trump. Hundreds of BNP supporters on Facebook defend Johnson with many calling for him to become the next prime minister. There has been a spike in attacks against Muslim women in Britain in the week following Johnson’s comments. 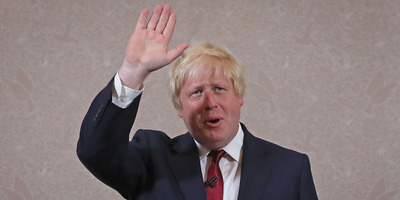 LONDON – The far-right British National Party has backed Boris Johnson in the row over his comments about Muslim women wearing the burqa, congratulating him for following Donald Trump in standing up to the “globalists” who condemn him. The former foreign secretary is currently under investigation by Conservative party officials for comparing Muslim women who wear the burqa to “letter boxes” and bank robbers. Johnson has so far refused requests to apologise for the comments, leading to the BNP praising him for “styling himself on the new model” established by Trump. 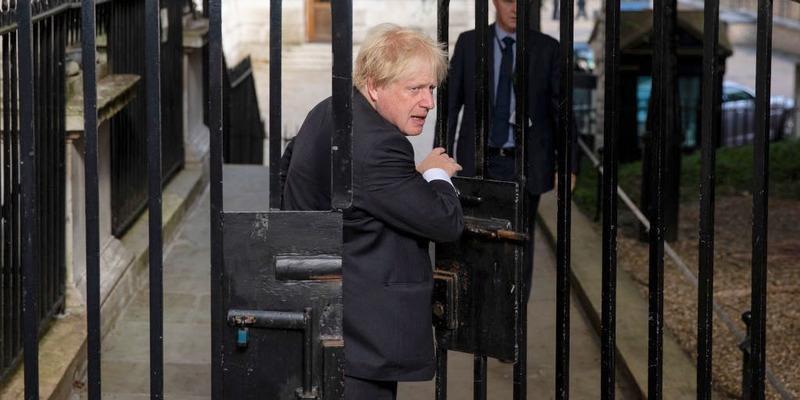 “Could it be that Boris has not only taken to heart the President’s endorsement, but also a queue from his unorthodox, straight-talking popularist rhetoric?” a post published on the party’s website on Sunday states. 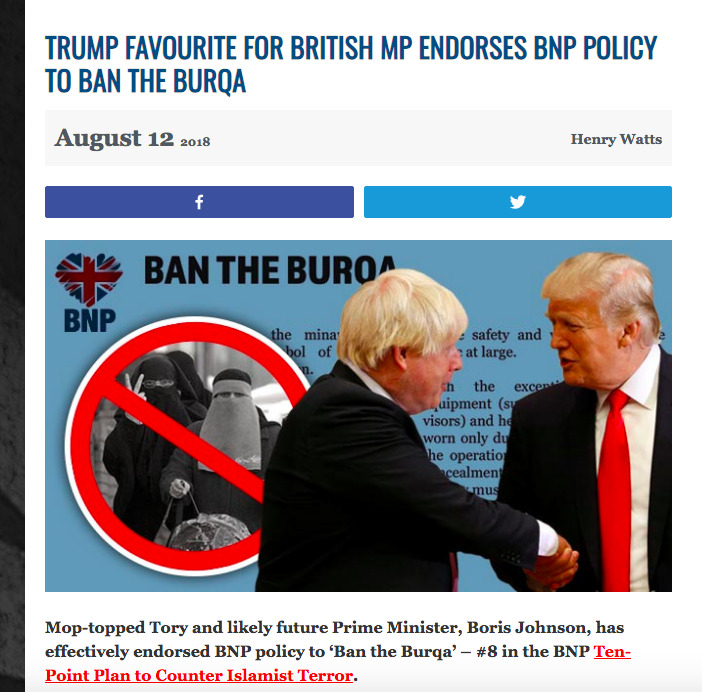 In fact, unlike the BNP, Johnson has not called for the burqa to be banned. On the party’s Facebook page, hundreds of BNP supporters urged Johnson to stick to his ground, with many calling for him to become Britain’s next prime minister. “I’ve never voted Tory in my life, and swore after this Brexit fiasco I never would vote again for anything, but Boris would get my vote if he were in power,” one BNP supporter commented. “Keep going Boris you would make a good PM,” said another. It is not the first time the party has backed Johnson. When he first ran for London mayor in 2008, he was beset by allegations of racism due to comments he had made as a journalist for the Spectator magazine when he labelled black people “piccaninnies with “watermelon smiles.” and defended Islamophobia as a “natural reaction” to the religion. Back then the BNP instructed their supporters to give Johnson their second preference, in the London mayoral election, which Johnson publicly rejected. The Tell Mama group, which monitors Islamophobic attacks against Muslim people in Britain, has reported a spike in attacks against Muslim women wearing religious head-coverings, in the week following Johnson’s Telegraph column. The group reported that a number of incidents reported in the days following Johnson’s comments included the attackers using Johnson’s “letter box” jibe against the women. In a statement, the Muslim Council blamed Johnson for the spike and called on the Conservative party not to let the former foreign secretary off the hook in any investigation. “Mr Johnson’s deployed memes used previously by the far right and his comments appear to have spurred on anti-Muslim bigots, with attacks on Muslim women on the streets,” the council said in a statement to Business Insider.